Inch o/d by two and a eighth inches long .any ideas? Someone here on the forum uses a simple piece of clear vinyl tubing to connect the two petcocks. Apparently no heat issues. Maybe he'll join in. Bud - I believe that would be Steve Jelf,....and it's a great idea! Much less chance of a "malfunction" such as a stone breaking the glass, etc. Here's what Harold is talking about, including my explanation of how to use it. If you want it to be glass check this out. There's no heat issue with using the clear plastic - used it on my TT in place of the glass and never had an issue (and there's no worries about losing the oil to a broken glass). One of the drivers in the Montana 500 used plastic between the two petcock holes. The plastic melted and you could see a rod sticking clear out through the side of the block. Geez Dave, I wouldn't have thought a connecting rod could make it around the corner and fit through the petcocks and out through the melted plastic. Wow! The clear plastic tube idea is good, but the important thing is to turn off the petcocks after checking the oil level. Otherwise, if the tube should come off there will be trouble. "Opening both petcocks will show the oil level, but except when I'm checking the level both petcocks will remain closed. 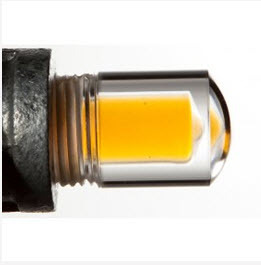 Even if the tube gets knocked off, the oil will stay in." Seems kind of obvious to me. hole in the top plug so it dont get air bound. The oil drop isn't scary; it's reassuring - it means that the sight gauge is working, isn't blocked, and the glass isn't stained. I often do this check - after starting as well as before. A flow restrictor makes any sight gauge safe. I'm tired of repeating this. Here is something I found for oil level inspection. It is an industrial acrylic level indicator that is rated up to 230 deg. F at atmoshperic pressure. It threads in and provides a constant view of the presence of oil.